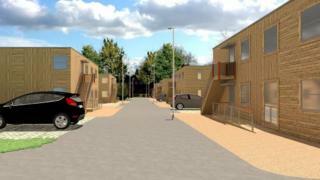 Work is to begin on a temporary housing scheme for homeless families in Reading. The 28 prefabricated homes will provide emergency housing for people who would otherwise be forced to stay in bed and breakfast accommodation. Reading Borough Council said it had about 120 families staying in guest houses at the end of 2016. Work begins in Lowfield Road on Tuesday with the first residents due to arrive in the autumn. The development, on the site of a former mobile home park, will consist of seven timber-clad blocks of four units, two storeys high, a children's play area, car parking and bike sheds. Each unit will have two bedrooms, a bathroom, kitchen-diner and a living room. The 28 homes are intended to house homeless families while they are waiting for authority-owned or housing association accommodation to become available. Legally councils can house families in temporary accommodation for a maximum of six weeks. The council said the stock of affordable housing in Reading had reduced because of high land prices and rents, as well as right-to-buy sales. Housing councillor Richard Davies said: "Reading, along with many other towns and cities in the region, has seen an increase in the number of families requiring emergency housing. "This has resulted in the council being forced to use bed and breakfast accommodation which is unsuitable and disruptive for homeless families."